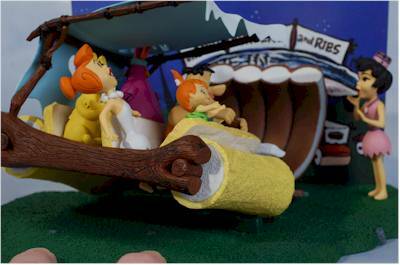 Flintstones, meet the Flintstones...they're the modern stone-age family. And they're getting action figures from Mcfarlane Toys. 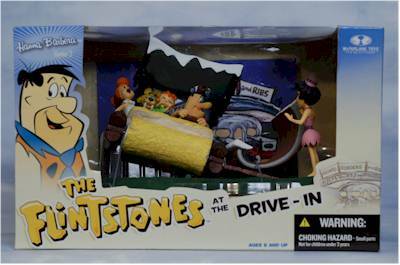 Now, if you were like me, you might not have been too thrilled with the first two Flintstones we got in series 1. Both figures were more Rat Fink than Bedrock, with Fred on a stone age bike and hot rod. But series 2 promised us more standard looks for Fred, Barney and the clan. 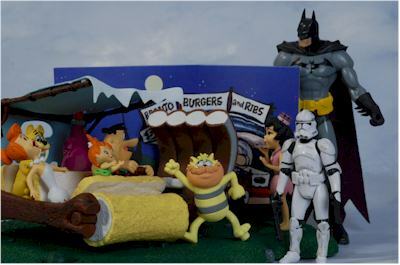 The deluxe boxed set is based off the opening credits at the drive-in, when the huge ribs get delivered to the car. This boxed set is hitting some limited retailers right now for $20 - $25, depending on who the retailer is. Unfortunately, distribution on this second series and the corresponding boxed set has been terrible. 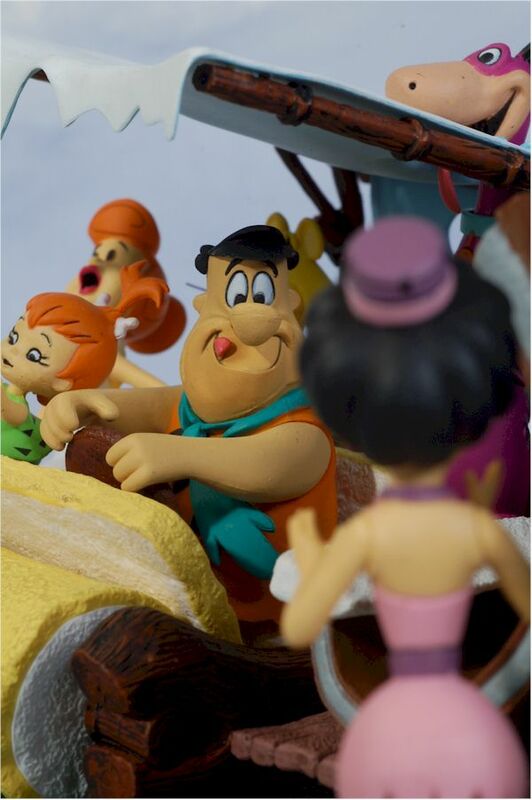 Toys R Us is the only one of the big three to pick up the Hanna-Barbera line from McToys, but they've been very spotty with series 2. These hit in Canadian TRUs before Christmas, and they are at the tru.com website, but they have yet to make it to any stores in the States that I know of. Our local Meijers has started putting out the boxed set, but no sign of the actual figures yet. It looks like a lot of the online retailers that carried series 1 aren't picking up the second series either, so getting this set is a little trickier. This doesn't bode well for wave 3. The set comes packaged in a window box, similar to a number of the recent past deluxe boxed sets from McToys. It's attractive, and it will keep the set safe on the way to the retailer and on the car ride home, but it's very similar to the series 1 box. In fact, it's so similar that you'll have to be sure to really pay attention to notice it, and not just quickly assume it's just the first series set. That was particularly true where I found it, because they had these and the first series boxed set stacked together. There's one annoyance factor here though. Under the car is a plastic tray/wedge. This tray holds the car in the fully tilted pose. This tray is attached to the base underneath the car with a tab that fits into the base. When I pulled the tray out, this tab ripped off, and I still haven't managed to reach under there and get it pulled out completely. I'll need to get the old needle nose pliers out. 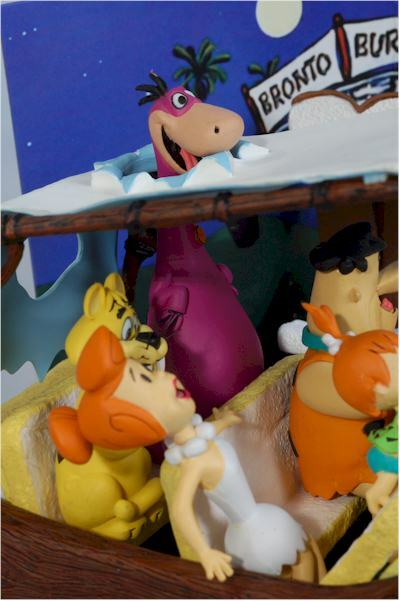 The figures are sculpted in that classic moment from the end of the show, when Fred gets his order of brontosaurus ribs delivered to the car. The whole family is here, with Fred in the driver's seat, Wilma to his right, caught off guard by the sudden tilt of the car, Pebbles between them, enjoying it all, and the family pets in the back seat. 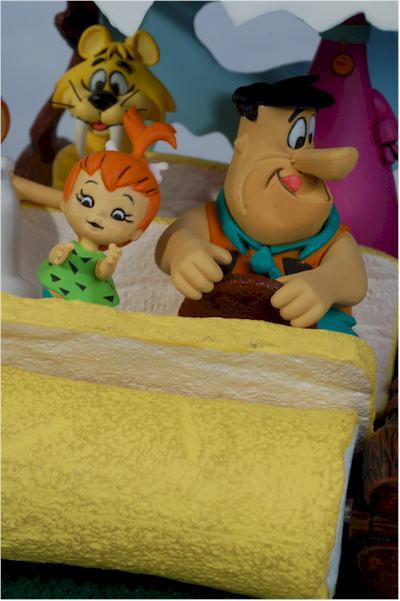 The scale of the figures to each other is pretty good, especially with Fred, Wilma and Dino. Pebbles is a bit big, which is often a problem when cartoon kids get translated from 2-D to 3-D. Still she's not overtly huge, and only the diehard fans are likely to notice. Or if you're like me, and checked it against artwork from the show. The set shows all the cool detail you've come to expect from anything Mcfarlane produces. 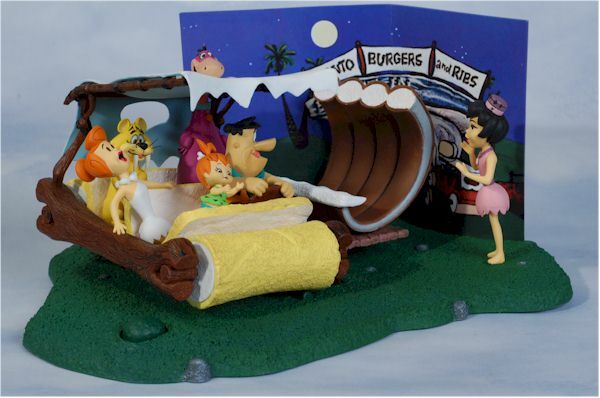 There's plenty of texture here, especially for a cartoon set, and the car is particularly well done. 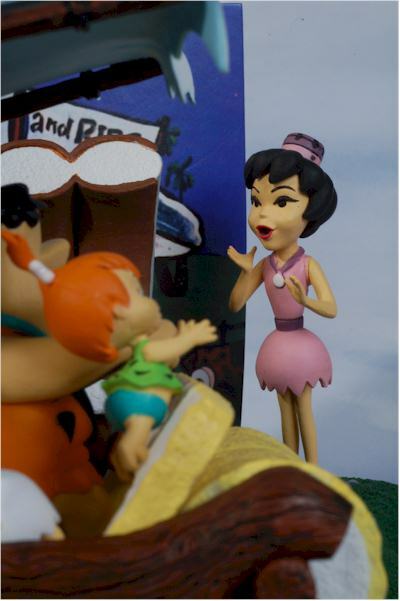 Some of the individual characters have minor issues, most notably Fred. Perhaps it's because he's the most recognizable and memorable, but his features seem slightly off. The nose is larger and longer than most artwork, and the lines of the hair, chin and forehead don't seem quite right too me. You can simply check him against the more traditional artwork on the front of the box to see what I mean. The set is small though, with the figures standing only around 3" tall. That makes them big PVC's more than 'action figures', and is clearly not in scale with the other figures in the regular line. My only real issue with the set is the cardboard backer, which depicts the screen and sky. The backer fits into a slot that takes on two shapes - a curve on the right, with a sharp angle into a straight section on the left. That means you have to bend the backer at about the midpoint, where there's a small slot at the bottom. This bend isn't 'pre-bent' for you, with a line up the backer. Instead, you simply have to bend it yourself. While you might think that would look better - no line on the backer as part of it's manufacture to ruin the look - it actually causes a bigger visual problem. When you fold it, no matter how careful you are, you're going to get the little crease lines running out from the fold. It's thick cardboard, so there's really no way to avoid it without the line being folded into it right from the factory. If you're careful, you can minimize it though. Some of the McToys cartoon figures - most notably the Simpsons stuff - has not had the same level of quality in the paint ops as the other lines from the company. Not sure why this is, but it's definitely been noticable. This set is a big improvement though over some of the work we've seen on the cartoon lines, including the first series of the H-B figures. Now, I've only seen two of these in person so far, so they may not be indicative of the overall quality, and you'll want to spend a few minutes checking them out at the store before making a final selection. There's lots of nice, bright, vibrant colors here too, and the majority of it is clean and neat. The only oddity that struck me was that Fred's lower face doesn't sport the 'five o'clock shadow' paint job. While it always wasn't an extreme difference - how dark it was did tend to vary - it was always a distinctly darker color than the rest of his face. There was also always a black defining line around this part of his face, and I'm quite surprised they didn't include it. The earlier boxed set Fred does have a better defined line and *slightly* darker color, but the series 1 Fred on the chopper did not. Ah, and here you thought the set was just an unarticulated diorama. Nay, nay! And I'm not talking about the action feature here, because I'll cover that in a later section. Nope, there's actually two points of articulation on the set - three, in fact. Both the front and rear stone wheels spin. Yea, it's not much, but I take what I can get. And Dino's head turns! While the minor articulation may have been a surprise, the lack of accessories is not. This is a solid set with a cardboard background, and nothing is removable without using implements of destruction. All of series 1 had some sort of 'action feature', and some were far better than others. Toss this one in the 'meh' category. There's a button on the front of the set, embedded in the grass. Press it and the car tilts in the direction of the bronto ribs. Woo-hoo. Or should that be Yabba, Dabba, Doo. The car itself never rests flat on the grass on both tires to begin with, so the action is a bit silly. Also, the car should ALWAYS be tilted anyway with the ribs on it, so it's a bit non-sensical as well. Perhaps if the car leaned down to the ground when you pushed the button, and popped back to a tilted pose when you released it...at least that would make more sense. But you can enjoy the diorama without ever pushing the button, so it doesn't do much to hurt the set overall. The set has the silly action feature, but beyond that holds no play value. This is a set for fans of the show to put on their desk at work, and push the button in amusement once in awhile. That's not a big surprise though, since this is not a kid's line. The only way most kids recognize Fred these days is as the guy from the Fruity Pebbles ads. The usual price for this set appears to be $25, but that's a tough sell. It's fairly small, and has no detachable figures. I paid about $20 for it though (and have a suggested site below where you can do the same), and at that price you can add another half star to this score. Obviously, you'll want to watch for any paint issues. Also, take your time folding that background to avoid adding any more wrinkle lines than necessary. I looked at the box a few times and gave it a couple practice tries before going for it. The sculpt and paint save this set, although it is smaller than I hoped. I have some basic issues with Fred, but the rest of the figures (especially Dino and Baby Puss) look great. I can do without the action feature, and in fact plan on putting something under the back wheel to prop it up in the fully tilted version for regular display. 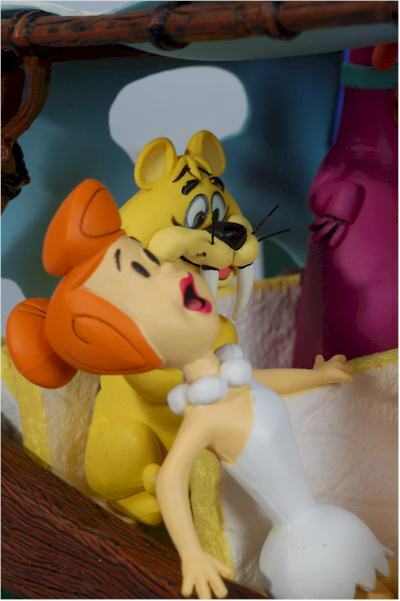 Series 3 was originally set to include Huckleberry Hound, Snagglepus, Grape Ape, The Jetsons, Secret Squirrel, and Tippie Toe Fred, with a deluxe set called Quittin' Time Fred. However, I'm going to be very surprised at this point if we see that set make it out, which will be a big disappointment. I REALLY wanted a Secret Squirrel. This set does set the record straight once and for all that Fred wasn't as interested in the ribs as he was in...well, I'll let the final photo tell the story better than I can. - Clark Toys has a great price on the set at just $20. They also have some of the single figures for $12 each, but others are currently sold out. - Time and Space Toys has preorders for all the regular figures at $13 each, but they don't have this boxed set listed. - and if you're in the U.K., Forbidden Planet has the regular figures at 10 pounds each, and this set for 20 pounds. I reviewed the first series of figures, along with the first deluxe boxed set. I'll be reviewing the whole set of series 2 figures once I get my mitts on them.